Influencing behavior takes many forms. Giving a people a way out is often one of the better, long term solutions. The theory goes if you can provide an acceptable alternative behavior that benefits the audience and supports your goals & objectives, you ought to try it. 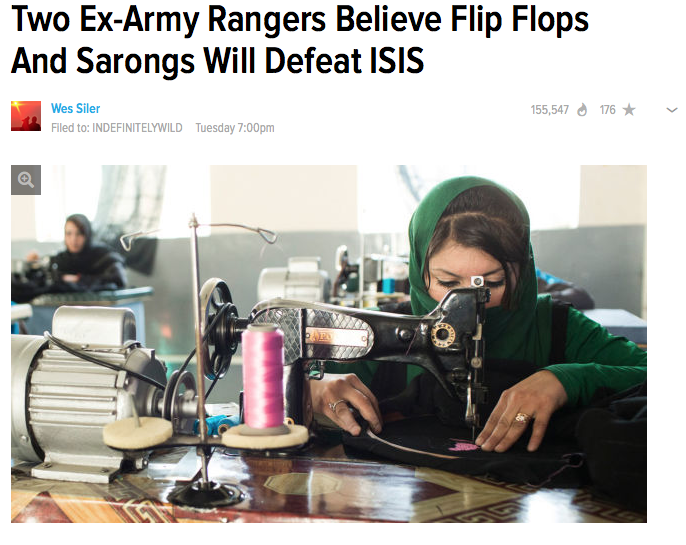 The article on combat flip-flops (see: http://gizmodo.com/two-ex-army-rangers-believe-flip-flops-and-sarongs-will-1687822266, which is also the photo source) presents a pretty compelling argument. PSYOP working in tandem with Civil Affairs and PAO would support these efforts and help turn insurgents into productive citizens. Which leads perhaps to a more interesting question and that is – should the mission of PSYOP be expanded to include occupational and business training? 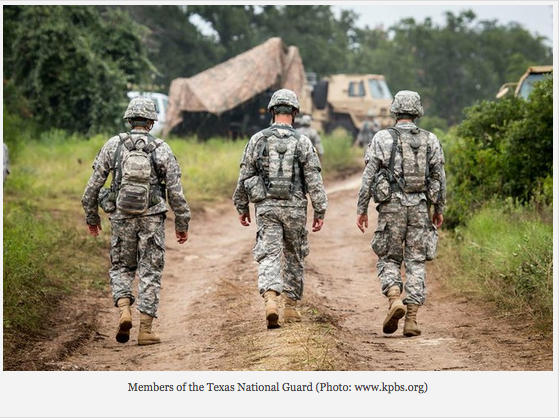 PSYOP (MISO) Teams are in the best position to work face to face with local populations. While training foreign citizens has traditionally been the purview of Special Forces, perhaps the time has come to split that function out of SF and into a ‘gentler’ force thereby enabling SF to concentrate on more appropriate missions. Computerworld UK (see: http://www.computerworlduk.com/news/public-sector/3596459/british-army-set-up-facebook-warriors-unit/?wpmm=1&wpisrc=nl_board, which is also the photo source) and other media have reported that the British military is standing up a 1,500 person Social Media Warrior Battalion. 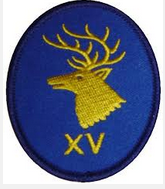 Dubbed the 77th Bde (which of course is bigger than a BN), it will be a composite unit made up of reserve forces (Territorial Army) and fleshed out with active forces taken from the British Army, Royal Navy and Royal Air Force. One wonders if this is simply a re-launch and renaming of the former 15th PSYOPS Group (see: https://wikispooks.com/wiki/15_%28UK%29_Psychological_Operations_Group). While there is no doubt that PSYOP is an important battlefield multiplier, one wonders if the Brits would actually devote such a large force to address these missions when their defense budget overall is under a great deal of pressure. It’s worth a moment to analyze this statement. If we take the statements together at face value it would appear that the British military will include combined units of active and reserve personnel. It would be reasonable to assume that the personnel strategy would be to have a small core and expand the core as needed. If so, the unit personnel would be housed together and presumably train together. Sounds like a model worth considering. Reader feedback, especially those with first hand knowledge of the UK force structure is much appreciated. A week or two ago my wife and I went to see “American Sniper”. I’m actually one of the very few veterans in my social circle, especially veterans who have been overseas and often get asked about my opinion of all things military related, so I felt it was a good idea. I’ve never been to Iraq or Afghanistan and in my Viet Nam and Bosnia tours I was lucky enough not to be in the thick of things. Nevertheless, I too faced readjustment issues. I thought Bradley Cooper did an outstanding job showing how Chris Kyle changed over his tours and upon his return. Movies are powerful experiences. By chance my wife was watching “Ghost Army” on PBS (http://www.pbs.org/program/ghost-army/). I thought I knew quite a bit about deception efforts in WWII, but I was totally wrong, I didn’t know sh*t. Turns out the 23rd Headquarters Special Troops combined Military Deception and PSYOP (MISO) on an unprecedented scale. They were tasked with ‘replacing’ designated units to make the enemy think a lightly manned area was actually heavily manned and at times to deceive the enemy as to the location of key forces such as armor and artillery. They used visual deception with blow up versions of tanks and artillery. This was supplemented with loudspeaker sounds to match. Rounding out the deception involved the use of fake radio traffic, painting vehicles with the unit designations and walking/driving around the AO wearing patches of the impersonated unit as well. The time has come for a PSYOP movie about the Ghost Army. It’s perfect! Easy to understand, has historical precedence and I’m sure George Clooney would jump at the chance to be in uniform again.